Image caption The RSPB had called the plans "totally unacceptable"
Plans which could have allowed some gamekeepers in England to capture buzzards and destroy their nests in order to stop them eating pheasants have been abandoned. 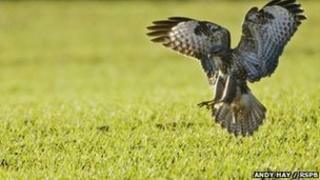 Ministers said they would look at other ways of controlling buzzards "in light of public concerns expressed". Animal rights groups opposed the pilot study and the RSPB said the rethink was a "strong decision". But the Countryside Alliance accused ministers of "giving in". Ministers had planned to carry out research into "non-lethal" methods of controlling buzzards in areas where there was evidence of a "clear problem" of them preying on young pheasants. Buzzards, which are a protected species, are thought to target pheasant release pens if they find there is a readily available source of food. Some gamekeepers have said their shoots have become unsustainable after more than a quarter of young pheasants were taken. Measures which would have been considered included issuing licences to destroy empty buzzard nests and allowing the birds to be captured to protect pheasant shoots, as well as providing protective cover for young pheasants and diversionary feeding of buzzards. Although ministers insisted they never had any plans to cull buzzards and they merely wanted to protect "legitimate businesses" from damage, the proposals prompted an outcry from wildlife groups, which argued they were unacceptable. And in a statement, Wildlife Minister Richard Benyon said the government would come forward with new ideas. "In the light of the public concerns expressed in recent days, I have decided to look at developing new research proposals on buzzards," he said. "The success of conservation measures has seen large increases in the numbers of buzzards and other birds of prey over the last two decades. At the same time it is right that we make decisions on the basis of sound evidence and we do need to understand better the whole relationship between raptors, game birds and other livestock. "I will collaborate with all the organisations that have an interest in this issue and will bring forward new proposals." The RSPB said it was "pleased" with the decision as it believed other methods could be used to limit buzzards' access to pheasant pens. "This is a strong decision, reflecting the strength of the nation's desire to see government protecting precious wildlife," its conservation director Martin Harper said. "The recovery of the buzzard is being celebrated by the public after many decades of persecution. It is clear that they don't want their taxes spent on removing buzzards and the government has to ensure that no bird of prey will be killed in the name of sport." But the Countryside Alliance - which campaigns on behalf of field sports - said it was "bitterly disappointed" by the decision since it believed the proposed research had been "sensible and proportionate". "Wild animal management is an essential part of the countryside that is largely misunderstood by those in towns, cities and, apparently, Whitehall," the organisation's campaign director, Tim Bonner, said. "This study was explicitly non-lethal and right for the countryside as a whole. That the government has chosen to ignore rural people in favour of a large and vocal special interest group shows ministers are now willing to give in to whoever shouts the loudest." Labour said it supported the government's change of heart, claiming its original plan had been "ill-thought through". "This was the latest environmental blunder from a government that has long forgotten its pre-election green promises with the forests sell-off and badger cull," said shadow environment secretary Mary Creagh. Buzzards have been protected for more than 30 years and there are estimated to be between 72,529 and 90,661 breeding pairs in the UK.